Several significant events occured on Onew’s birthday that will be a wonderful memory forever. On 12 midnight KST 14th of December 2014, fans all over the world rushed to wish for Onew’s birthday along with hashtags #26YearsofOnew. 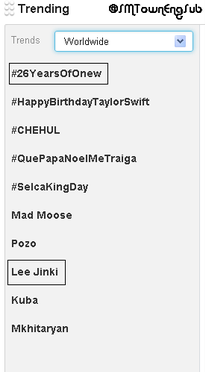 Few minutes later, this hashtag and ‘Lee Jinki’was trending #1 and #8 respectively. A big force of Onew union fan page which was created and joined by thirteen Onew fansites 온더레코드, 온유랑, 온유이시여, Astronewnote, Healing Space, MERRY GO ROUND, No reason, Onleeonew, Onew Heart, SWEET BUNNY, Snow Flake, Sweet Sound, PAST PRESENT FUTURE accomplished a fund raising event. 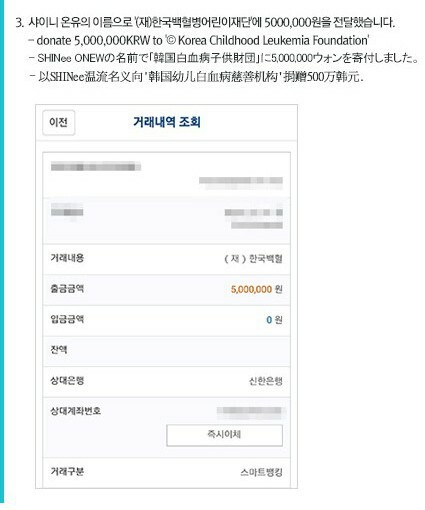 The results of fund collected among shawols, 7,000,000 won was donated through Naver Happy Bean to help Onew’s previous Alma Mater scholarship programme.Secondly, the union donated coal briquette to the impoverished people in South Korea. Third, a donation of 5,000,000 won each was also given to the Korean Foundation for the Prevention of Blindness and to the Korea Childhood Leukemia Foundation. SHINee performed on their last round of Japan Arena Tour concert in Kobe on 14th of December. The concert was a very memorable moment for Onew since the stadium was filled with audiences’ voices singing a birthday song, twice for him during encore. A cake was also prepared for him on stage. What made it more memorable is that Onew’s mother came and watch the concert too. Jinki was trying to resist but in the end tears came out and when everyone sang “happy birthday onew”, he bowed in the middle of the song and couldn’t stand up. Then when he stood up, he said “I mustn’t cry~” as he tried to hide his wet eyes with a full smile. When the audiences sang again, he said “Thank you very much. I love you. See you again” with a trembling voice. He was the last to leave the stage. Later on, Onew tweeted to expressed his gratitude personally to all fans around the world. SHINee’s Onew was the next celebrity to take on the ‘Ice Bucket Challenge,’ but he chose to only donate rather than drench himself in cold water for health reasons.